TenFourFox Development: Ad-blocker-blockers hit a new low. What's the solution? Until I see some INDEPENDENT Journalism again - screw news outlets. This modern Charles Kane/William R. Hearst crap is the very Mussolinian definition of fascism and much like government, voting and democracy today, no longer works well enough to justify its existence. I'm afraid revenue sharing with the provider just isn't viable. There is a billion of sites, nobody is going to be able to split the money fairly. Ads are good way to finance web media or just websites in general. People that are unwilling to accept that should accept not having access to the sites. It might sound harsh but I think we just have to accept that we can't have everything. People today assume too much and feel too entitled to everything sometimes. 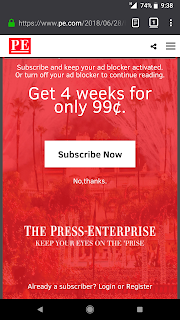 The payment through ads is what the authors of the content chose as a price for perusing the site, I find it even insulting that people just casually ignore them. I remember the 1990s and how great it felt that news and articles about stuff were free on internet, thanks to the advertisements paying for it. It was great because I didn't have to pay for printed newspaper/magazines. Today people forgot and don't appreciate that one least bit and think that the publisher/author is some sort of a criminal. Internet has spoiled people incredibly. Sorry for rant but I think people need to be reminded of this. I don't understand why online ads have to be interactive in the first place. I still see plenty of billboards around. The papers themselves are still able to sell the ads in the actual paper version. I wouldn't block most what I do if it was simple. 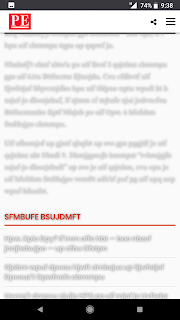 I don't mind ads, just the ones that make it not worth the time to read the page it is on in the first place. 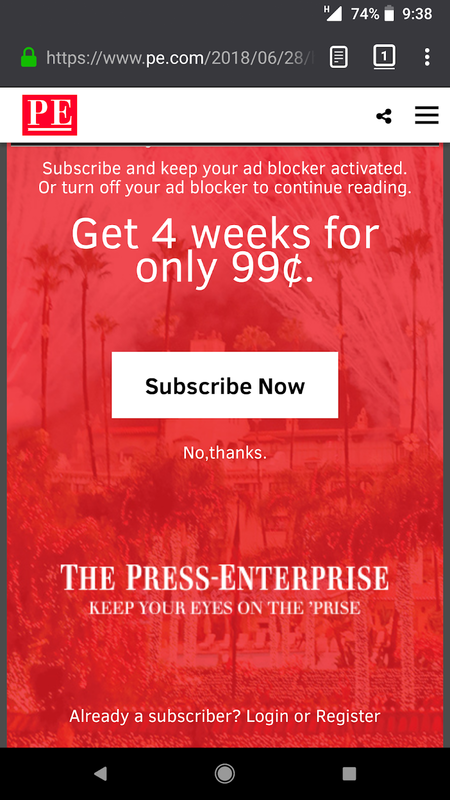 I don't know what your ad blocker is triggering on their site btw. I have some blockers and I can read it on my iPad. Try your local library. There is a ton of digital content, including subscriptions, that are available free of charge with your library card. Being that you're having this problem with a local paper, check to see if the library provides it to you gratis.